FinalBuilder Professional features automatic integration with any Version Control System which supports the Microsoft SCC API. Projects can be automatically added to source control, checked out, edited, and checked in from inside FinalBuilder. To use the Source Control Integration features of FinalBuilder, you will need to be using a Version Control System which provides a Microsoft SCC API Provider Plugin. To use a project from inside FinalBuilder's SCC Integration, you first need to add it to source control inside FinalBuilder. 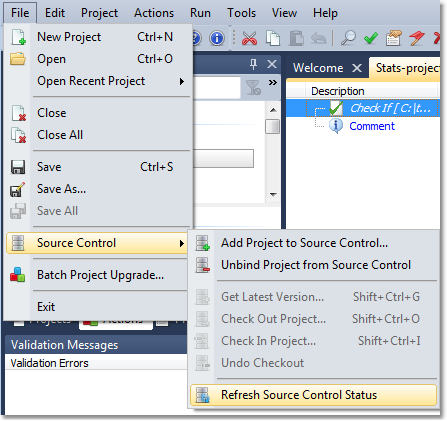 Select "Add Project To Source Control" from the File -> Source Control menu. You will be prompted to choose an SCC Integration Plugin from those which are available. If the plugin you wish to use is not shown, you may need to download and install an additional "SCC Integration Plugin" package from the Version Control System vendor. When you have chosen a provider, click OK. The next stages will depend upon the provider which you have installed. The source control provider may ask you for a source control project to use with the working directory that contains the FinalBuilder project. It may also ask you for other information relating to adding the project file to Source Control. To unbind a project from source control, choose the "Unbind Project from Source Control" command from the Source Control menu. Note that unbinding a project does not remove the file(s) from source control, it merely removes the connection between FinalBuilder and the source control project. If you wish to delete the files, you will need to do so manually. Note: Moving, renaming, or "Saving As..." a FinalBuilder project will automatically unbind it from source control. To rebind the file, simply choose "Add Project to Source Control" again. 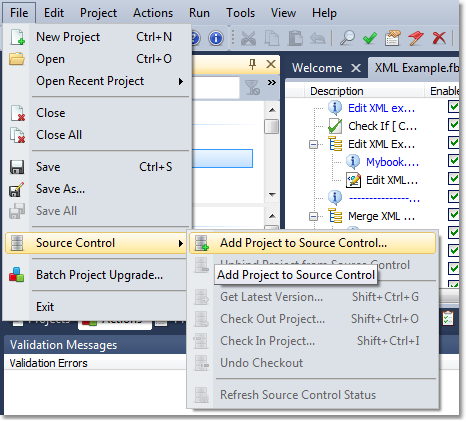 Select this menu item to fetch the latest version of the project file from source control. The project will be reloaded if a new version is fetched. Select this menu item to check out the latest version of the project file form source control. Select this menu item to check in a checked out version of the project file. Your source control provider plugin may prompt you for checkin information such as comments and workflow details. Select this menu item to undo a checkout on an checked out FinalBuilder project. The project will be reloaded with the original, checked in, version.